I spent 6 months in treatment and have been in remission since December of 1997. Eventually the side effects of the radiation treatment set in and the scar tissue in the radiation area set up like concrete. I reached the point where I couldnt move my left hip or knee. I walked with a very pronounce limp. Ive told you all of that so that you can know that I know what it is like to live with a physical disability. As you know from my previous posts, I now have a concealed carry permit and have been working out the best way for me to carry a concealed weapon. Dont Let Someone Else Tell You What Is Best For You  talk to people, get opinions but when it comes down to it, you need to carry what works for you. Dont let someone tell you that you should be carrying a .45 for the stopping power when your arthritis will barely let you use a .22. The choice of a carry pistol has to be what works best for you. 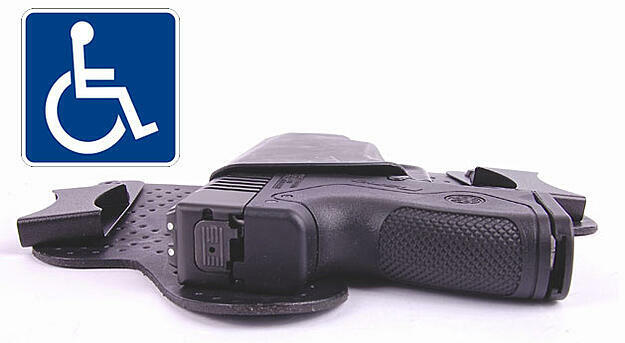 When is comes to how you will carry concealed, you will need to figure out what works best for you with that too. In your case, a lot of the recommended conceal carry techniques and holsters may not work for you. Dont let someone else tell you what is best for you. You need to work it all out in a way that best suits your needs. Practice Your Way  Once you have the best method that fits your situation, practice, practice, practice. This applies to everyone but more so to someone with a disability that might impede their ability to draw their weapon. Sorry but thats just the way it is. Dont Carry a Gun  I know that sounds radical but hear me out, if your disability doesn't allow you to draw or shoot your pistol or allows an attacker a more than average chance of taking your pistol away from you, dont carry one. You are responsible to be able to defend yourself and your loved ones. If your disability makes carrying a pistol a danger to others either by your inability to fire the weapon safely and accurately or by the potential of your weapon being used against others then you should seriously consider not carrying a pistol.